It’s not always egregious, headline-grabbing problems that affect an organization’s bottom line. Today’s most successful organizations know that working through more subtle Diversity and Inclusion issues is key to reaching their full potential. 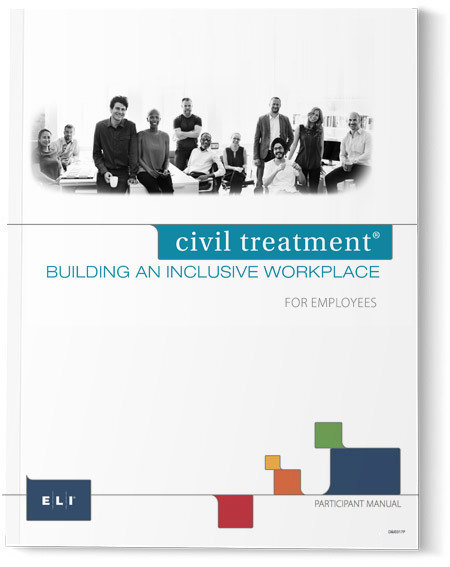 Using ELI’s proven methodology and a series of interactive exercises, videos, and discussions, Civil Treatment®: Building an Inclusive Workplace for Employees helps build the business case for diversity and inclusion based on participants’ individual experiences and goals. Participants will explore several scenarios and apply skills for building an environment where everyone’s ideas and perspectives are welcome. The course is anchored in the organization’s values and positive business and personal outcomes. 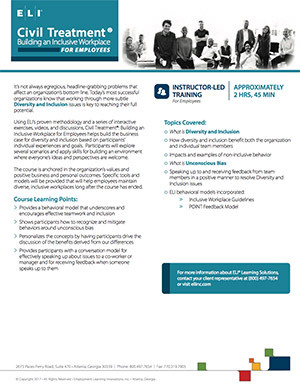 Specific tools and models will be provided that will help employees maintain diverse, inclusive workplaces long after the course has ended.